I’m in the process of helping a client’s husband develop his personal style. Since we’re starting from scratch, I’ve recommended that we start with the basics or things every man should have in his closet. By starting out with classic pieces that look great on everyone, it’ll be that much easier to find one’s own signature look. 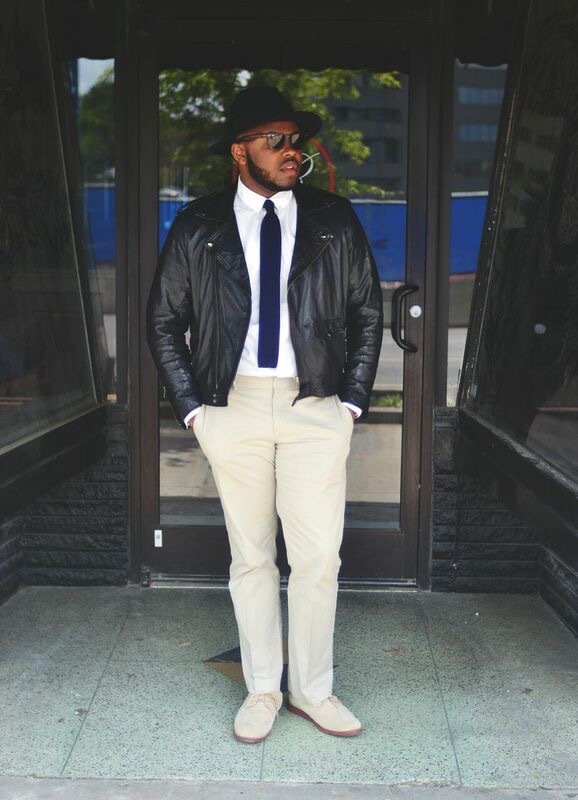 For example, I’ve put my personal twist on a simple button down and khakis by pairing it with a wide brim hat and leather biker jacket. Check of the slideshow of things every man should have in his closet. One thing that I’ve noticed about guy’s shopping habits is that we get complicated way to quickly. I was in a fraternity in college and my brothers were always asking me how to pair their shirt and tie with their suit. Usually their issue was trying to blend too many colors and patterns or putting together things that were way too complicated. I’m all for breaking rules, but it’s crucial to master the basics first! My solution to my brother’s coat and tie dilemma was to wear a white shirt or solid tie. That probably sounds boring, but it’s foolproof for guys that aren’t into fashion. Surprisingly a lot of my brothers wouldn’t have a white button down to wear to events, but they usually had every other color of the rainbow. I noticed this same phenomena during my stint working at Express. Guys would stock up on trendy colors, because they already owned one white button down. A lot of times we have trouble creating outfits because we don’t own enough basics. You can never have too many white button downs. We have to think of trendy clothing as salt and pepper. Trendy clothing is what helps us enhance our personal style. However, you run the risk of ruining your wardrobe when you go over board. Our style is always evolving and it’s easy to get tired of your closet when it’s filled with trendy pieces. You become stuck wearing the same noticeable pieces, which makes your outfits pretty familiar. Find a balance of classics and trends. Remember, once you master the basics you’ll always be in style. Before you start revamping your closet, make sure that you take your time. Think of your closet as a personal boutique. You want to take your time and curate pieces. I learned the importance of taking your time while shopping during my study abroad in Italy. We’re conditioned to buy things and return them later if we change our mind. I remember buying a top and trying to return it only to find out that it wasn’t allowed. That taught me to be 100% sure of my purchase before leaving the store. Quality and fit are the things you want to consider before making a purchase. When curating your closet, you want to make sure you select things that will stand the test of time especially when it comes to the classics. Quality is less important when you buy trendy clothing since trends are always going out of style. The fit of your clothing can make or break an outfit. It can also save you a lot of money. If you’re able to find inexpensive clothing that fits well, you’ll still look like a million bucks! What else would you add to this list of things every man should own?